This plan is balanced and economical, avoiding verbosity by dedicating only as much time as necessary for each section. Competence in Chiropractic Science is displayed and a brief description of the business operations is given, making the proposal focused and streamlined. 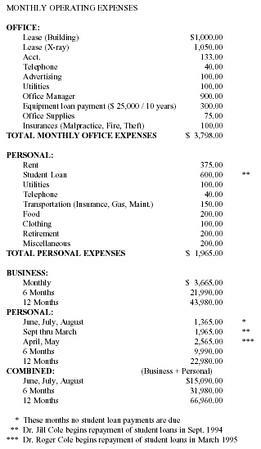 Emphasized are the expenditures and startup costs, justifying the loan amount requested. The following prospectus will provide information concerning the profession of chiropractic, office description, specific expenditures, practice and marketing plans, and supporting documents. We expect to be open during June 1994 at 1450 East Wells Street, Madison, Wisconsin. Chiropractic is a profession that has been rapidly developing since its discovery in 1895 by D.D. Palmer. Today, there are approximately 40,000 doctors of chiropractic in the United States. Chiropractors are primary health care providers, licensed in all 50 states, and are participants in most major medical insurances. Chiropractic is defined as the philosophy, science, and art of things natural, with the objective of locating, analyzing, and correcting the vertebral subluxation complex. The subluxation is the improper positioning of a vertebra from the ideal spinal model which causes interference of a nerve impulse from the brain to the body and back. According to Gray's Anatomy we know that the central nervous system controls and regulates the entire body. If we have an interference of a nerve to a particular part of the body, this part has lost the necessary communication to function properly. The rest of the body is also adversely affected since no one part affected can not effect the whole body. Doctors of chiropractic are the only professionals who are trained to locate, analyze, and correct the vertebral subluxation complex. Chiropractors adjust the vertebral subluxation complex by introducing a specific force in the direction that would thereby restore the biomechanical integrity, thus restoring the nerve impulse. Cole's Chiropractic Clinic will be located at 1450 East Wells St. This office is centrally located in Madison, and allows for easy access both entering and exiting the parking area. The office space is 1050 square feet, consisting of the following: 1 Reception Room, 1 Secretary Office, 1 X-ray Department, 1 Darkroom, 1 Restroom, 2 Adjusting Rooms, and 1 private office. Cole's Chiropractic Clinic will primarily serve a population of over 51,000 in a ten-mile radius. There are only 20 doctors of chiropractic in this ten-mile radius. The equipment that we will use in our office is the latest in chiropractic technology. The Videofluoroscopy X-ray unit in our office will be the only one within 150 miles of Madison. This machine is capable of recording motion, with a significant reduction of radiation exposure to the patient. 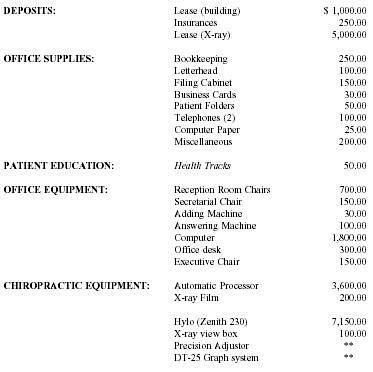 We will offer other doctors of chiropractic use of this equipment for a small fee so their patients can also benefit. Grand Opening: Personal invitations to family and friends. Invitations to residence and commercial establishments within 1 mile. Advertisement: Newspaper and other publications press releases. Yellow pages in phone book. Large business sign in front of office. Public Relations: Continuous series of public health awareness seminars. Participation in local civic groups. Patient Education: Quarterly newsletter, Health Tracks: Chiropractic a New Beginning, Office lending library. Patient Relations: Systematic patient follow-up procedure. Special occasion and thank-you for referral mailings. ** Note: This equipment has been purchased. Selected to be in Who's Who Among Students in American Colleges as a Student at Sherman College. Selected to the National Deans List.